Rinse and dry the halibut fillets. Sprinkle generously with the paprika, fleur de sel and cracked pepper. Set aside. Heat the oil over medium heat until hot. Add the rosemary and sauté for about 2 minutes until the oil is nice and fragrant. Remove the rosemary from the oil and discard. Turn up the heat and get the skillet very hot. Add the halibut fillets (you want to get a nice sear on the fish so make sure that the pan is really hot). Sear the fish on one side for about 2 minutes. Turn the fillets over and place the entire skillet in the hot oven. Let the fish finish cooking in the oven for about eight minutes, or until just cooked throughout. Remove from the oven and serve immediately. Great with my Heirloom Tomato, Corn and Basil Salad with Champagne Vinaigrette Dressing. I made this the other night after we had our cooking event in Napa and it came out perfect! 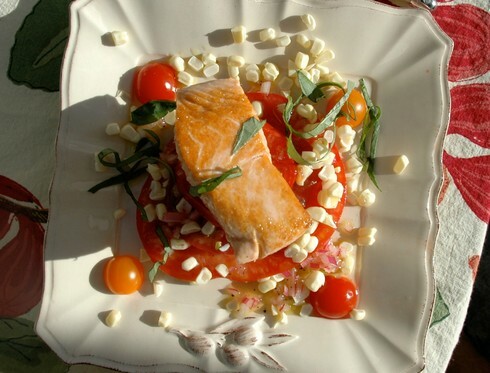 This is a great recipe especially over the corn salad with basil. Jenny, I am so glad you liked it! It is one of my favorites for summer!